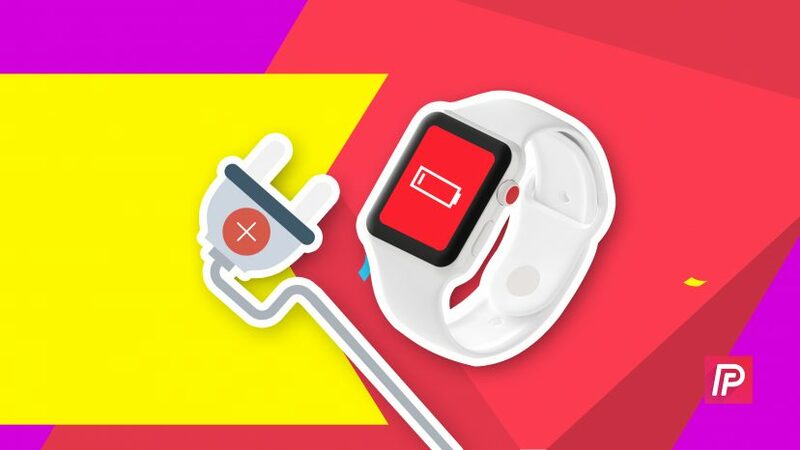 You are at:Home»Apple Watch»Apple Watch Not Charging? Here’s The Real Fix! Your Apple Watch won’t charge and you’re not sure why. You’ve placed your Apple Watch on its magnetic charging cable, but nothing’s happening. In this article, I’ll explain why your Apple Watch is not charging and show you how to fix the problem for good! If any one of these pieces stops working, your Apple Watch won’t charge. The steps below will help you diagnose which part of the process is responsible for your Apple Watch charging issues! Like your iPhone, your Apple Watch displays a small lightning icon which indicates that it’s charging. Unlike your iPhone, the lightning icon on your Apple Watch disappears after about a second, so you probably wouldn’t notice it if you weren’t looking for it. Fortunately, you can swipe up from the bottom of the watch face and tap on the battery percentage button to see if your Apple Watch is actually charging. 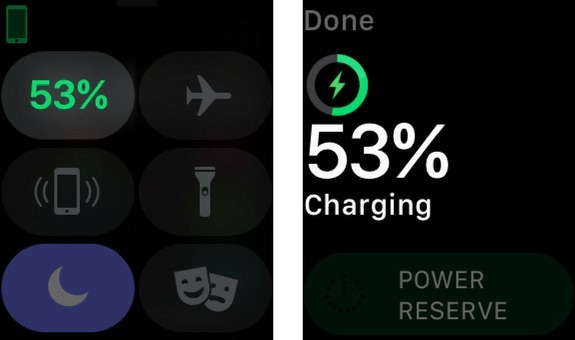 You’ll know your Apple Watch is charging when you see the word “Charging” below the battery percentage. If it’s your first time using an Apple Watch, the charging process can be a little tricky. There isn’t a charging port like the one you’ll find on your iPhone. Instead, you charge your Apple Watch by placing it on the concave side of the magnetic charging cable that it came with. The magnet built into the charging cable holds your Apple Watch in place while it charges. If you put a protective case on your Apple Watch, I recommend taking it off when you charge your Apple Watch. These cases can sometimes obstruct the connection between your Apple Watch and its magnetic charging cable. 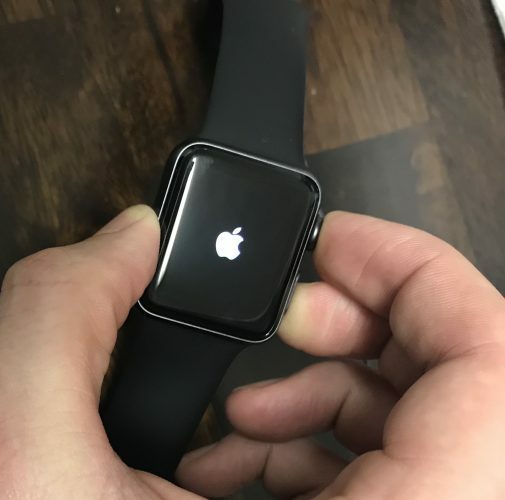 Our first troubleshooting step is to hard reset your Apple Watch, which will test to see whether or not the software of your Apple Watch has crashed. To do this, press and hold the Digital Crown and the Side button at the same. Release both buttons as soon as the Apple logo appears on the display of your Apple Watch. If the hard reset worked for you, then your Apple Watch has probably been charging the entire time! Your Apple Watch only looked like it wasn’t charging because its software crashed, making the display appear black. 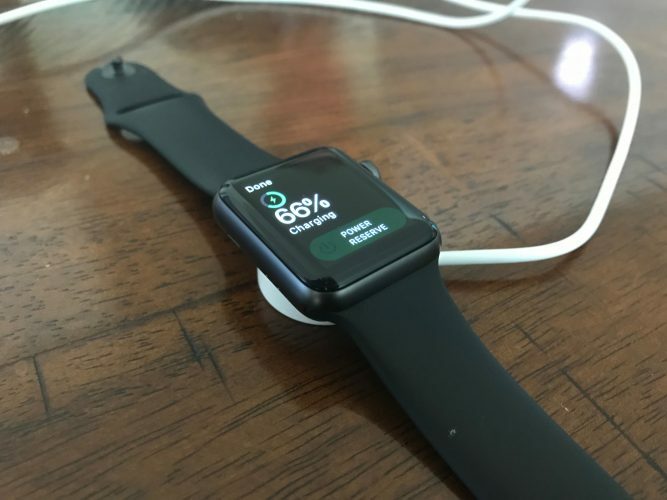 If the hard reset didn’t work for you and your Apple Watch still won’t charge, follow the steps below which will help you troubleshoot potential hardware problems with your Apple Watch, your charger, and your magnetic charging cable. There are many different ways to charge your Apple Watch. You can plug the magnetic charging cable into a USB port on your computer, a wall charger, or a car charger. Let’s say you normally charge your Apple Watch using a USB port on your computer. This time, try charging your Apple Watch using a wall charger. Did your Apple Watch start charging? If your Apple Watch charges when plugged into one power source, but not another, then the problem is probably being caused by the malfunctioning charger, not your Apple Watch. If your Apple Watch is not charging regardless of which power source you plug it into, move onto the next step! If using different chargers didn’t work, it’s time to try different charging cables. If you don’t have an extra Apple Watch charging cable, ask to borrow a friend’s, or purchase one on Amazon. If your Apple Watch charges with one charging cable, but not the other, then there’s probably an issue with the charging cable, not your Apple Watch. If there was an issue with your Apple Watch magnetic charging cable, try wiping it and the back of your Apple Watch down with a microfiber cloth. There may be gunk, dirt, or other debris preventing your magnetic charging cable and Apple Watch from making a clean connection. Make sure you also take a look at the USB end of your magnetic charging cable. Is there any gunk or debris stuck in the cable? If there is, use an anti-static brush or brand new toothbrush to gently wipe it out. Also check for fraying or discoloration along the charging cable — both can be signs that it needs to be replaced. Not all Apple Watch charging cables are made equal. The cheap, low-quality, knock-off cables you’ll find at your local gas station or dollar store typically aren’t MFi-certified, meaning the manufacturer of the cable is not part of Apple’s licensing program. Cables that aren’t MFi-certified can be very problematic — they may heat up your Apple Watch while it charges or may not even charge your Apple Watch to begin with. When purchasing a new Apple Watch charging cable, always look for the MFi certification on the package. If your Apple Watch is protected by AppleCare+, you can sometimes get the magnetic charging cable replaced for free by taking it into your local Apple Store. As I mentioned at the beginning of the article, the software of your Apple Watch is one of the four components of the charging process. Although we already tried a hard reset, it’s still possible that your Apple Watch is not charging because of a hidden software issue. 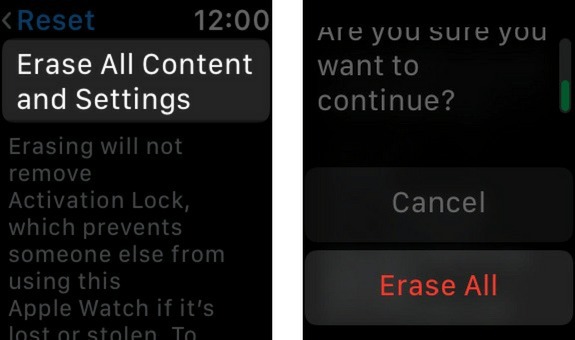 To eliminate an underlying software problem, we’ll erase all content and settings on your Apple Watch. This deletes all the content (apps, music, photos) on your Apple Watch and restores its settings to factory defaults. To erase all content and settings, open up the Settings app on your Apple Watch and tap General -> Reset -> Erase All Content and Settings. You’ll have to enter your passcode, then tap Erase All when the confirmation alert appears. Note: After you perform this reset, your Apple Watch will restart and you’ll have to pair it to your iPhone once again. If your Apple Watch still won’t charge, then there may be a hardware issue that’s causing the problem. Take it into your local Apple Store and have them take a look at it. I recommend scheduling an appointment first so you don’t have to spend your day standing around the Apple Store. Your Apple Watch is charging again! Now that you know what to do when an Apple Watch is not charging, we hope you’ll share this article on social media so you can share this knowledge with family and friends. If you have any other questions about your Apple Watch, leave them below in the comments section. Next Article Are Apple Watches Waterproof? Here’s The Truth!